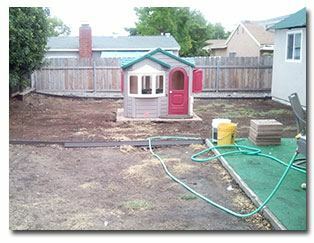 Tired of all the dust, on and in our home, from our “green-less” backyard, my husband and I decided to put in a new lawn. Our dog was always dirty, the kids didn’t have a comfortable place to play, the patio furniture was an endless effort to maintain; we really couldn’t enjoy what should be an inviting area to gather (not wasted space); our backyard. Looking back at the before and after pictures, the transformation is amazing. Some might cringe at the idea of installing a lawn with today’s water shortages, but for us, this was a decision based on many factors. 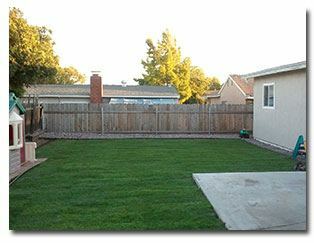 We made sure to do research on the latest water saving products and only installed the lawn where our family would receive a great benefit from it; in our case the backyard. Our front yard is designed with palms and rock. We installed all the latest water efficient irrigation and installed the sod ourselves. It was quite easy with all the expert advice we received from Grangetto’s and we saved on labor. Since we have kids, and in Sunny Southern California you can enjoy the outdoors year-round, we wanted green grass year-round. We decided Tall Fescue from AmSod would be the best choice. First we selected the grass type; tall fescue. We planned this new edition to our yard in September, when the rainy season was near so we would conserve water. To establish the roots you need more water in the beginning. First we planned the area to lay the sod. We made a drawing of where to lay the pipe so that we would know how much pipe, sprinkler heads and valves were needed. 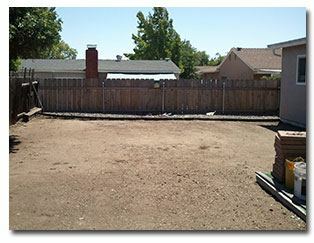 We removed the old mulch, weeds and flattened the area out. We spread gypsum and G&B Soil Building Conditioner to improve our soil. Next we dug the trenches based on our drawing. 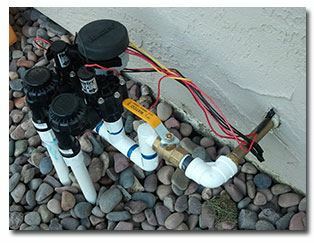 Then we installed the pipe and connected the valves to the water source. We tested the system and then glued the pipe down once we knew the system worked. Once glued, we waited until the next day to cover up the trenches. Our sod arrived at our door step from AmSod farms on the day we scheduled it to be delivered. Of course, the day we put the sod down it was 110 degrees! Ouch. Never-the-less it went very well. We noticed an immediate change in appearance and feel. Our yard feels cooler and we can breathe so much better without the dust. Now our family enjoys evening dinners outside and we don’t need to give the dog a bath every week. It takes longer than a month to see the smallest layer of dust on our outdoor furniture! The best part, besides saving money by doing the job ourselves, is watching our son kick a soccer ball around the yard with the dog chasing his feet!